Electronic publishing and electronic means of text and data presentation have changed enormously since the first edition was first published in 1997. This second edition applies traditional principles to today's, modern techniques. In addition to substantial changes on the poster presentations and visual aids chapters, the chapter on proposal writing discusses in more detail grant writing proposals. A new chapter has also been dedicated to international students studying in the United States. After teaching English composition and world literature, Martha Davis crossed the line between the humanities and the sciences. Always an aficionado of biology and gardening, her interests led her to the biological and agricultural sciences where she has worked for some 15 years mostly with graduate students relative to their communication skills in science. This handbook is the result of seeking answers to their questions and of recognizing that most other communication handbooks are limited to specific areas of writing or speaking. 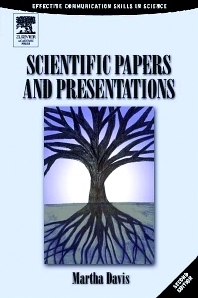 Scientific Papers and Presentations is her attempt to put under one cover the basic guidelines for the communication endeavors of the graduate student as well as the professional scientist.